I'm seriously considering replacing the old, original leather interior seat backs on my 1910 Touring and would like some input. I wasn't planning a full, body off restoration on this car when I purchased it, and I really liked the fact that it still had it's original leather interior. However, the stars were against me and it's turned into a full blown restoration. I'm going to have to sand down the old paint and do some body repairs first, so I figure taking out the old leather seat backs would make things a lot easier. Also, someone had replaced the original seat bottoms with cheap material so I've already installed correct leather bottoms from Classtique Upholstery. And even though the original leather is still serviceable it does have several holes in it and is very dry despite my several attempts to soften it. Lastly, once I'm through with this project, just about everything on the car will look brand new except the seat backs! So my question is two fold; first, how difficult is it to install leather seat backs in an early T and second, if you've done it can you give me some pointers? Thanks ahead of time for your thoughts! Anyone??? I can't believe no one's ever installed their own leather interior before. I have only replaced my 1913 seat cushions with Classtique seats. Having done that... when I am ready to replace the rest I have decided to take the body up to Elizabeth, and pay a little more to have an expert do it. I have done it on a Pierce years ago. The hardest part was laying out the pattern so if you use a Classtique kit where they have the pattern laid out it is not too bad. As I recall, I used synthetic horse hair and first laid out the material to establish where it needed to be tacked at the bottom. I used staples to secure the bottom temporarily. I then began filling the with horse hair working the whole thing up using a paint stirrer to pack the horsehair in until I got the desired fullness. The hardest part was the corners. Getting them wrinkle free was very difficult and required adding and removing stuffing numerous times to get it right. The last step was to tack and trim the material at the top, remove the staples at the bottom and replace them with tacks. I used spring clamps to keep the material loosely attached at the top moving the clamps as I worked the horsehair into the seat back. Be careful not to overstuff at the bottom or else the seat cushion will not fit. After making that mistake I had to remove some stuffing from the bottom. I then put the seat cushion in place and stuffed it again to get the right fit. The results passed the "red face test" but I would not do it again for anything other than a driver! There is a reason upholstery work is so expensive to have done. Most of us can do a marginal job but only a professional can do a 100 point job! Hi Bill, Why don't you take a photo of your existing upholstery and send it to Mike at Classtique Upholstery. The phone # 800-208-9032. Get him to make what you want. You can install it. When you install it, just start in the center and work your way to the edges. All great advice - I knew you all would come through! I didn't know Elizabeth was doing install work now. I called her and unfortunately, she will only make a trip to my home state if there are other install jobs to make it worth her time. Then we could split her travel costs. I'm not in a big hurry for this project, but something I need to give serious thought to. Bill, I ordered a complete interior and top for a 14 touring a couple years ago from Mike at Classtique.When the leather arrived it was so beautiful I decided to call Elizabeth and have it done by a professional which she is. She came to our shop in Pensacola with her big red trailer did the interior and top, best decision, time and money I could have spend, not to mention the learning experience I had helping her. Thanks Elizabeth fantastic job. You can certainly do your own upholstery work. We did the upholstery on my brothers 1911 touring. 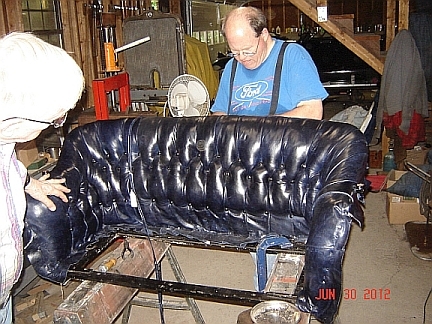 This was our first time to do tufted leather over horsehair. The stuffing is real horsehair not foam or artificial fillers. The best thing you have going for you is the original leather. By carefully removing the leather and materials that make up the seat back you can study how it was done originally. The height and width of the diamonds are important and you can measure the them on the original leather. The size of the diamonds determines the fullness of the cushion. Also note the seams where the leather is joined together to make back out of what appears to be one panel. The back is not made from one piece of leather. Typically is it three pieces with seams joining the panels in the corners. Also note that some of panels are sewn together (typically the first row at the bottom). The other seams are secured with the buttons. For installation the leather and burlap are marked with the diamond pattern, buttons installed and the horsehair is stuffed into the pockets between the burlap and leather. That is a simplified explanation and it is kind of hard to describe. Unfortunately there is very little information about how to do this type of work. We just studied the original seat material and tried our best to duplicate it.